With a well defined set of needs, arranged into a hierarchy, the task now is to determine which of those are most important to deliver a product that generates customers interest. Do customers prefer product features that emphasize the fulfillment of “important” needs? An anchored scale, where customers assigned weights to each need on a scale from 1-10, where the most important need got 10 points. They performed this task at both the primary and secondary levels, using 7 needs at each level. They then mailed questionnaires to 5,600 customers with 1,400 going to each of the three methods. Another 1,400 surveys went out for consumers to rank their interest and preference in 7 distinct product concepts, each one designed to emphasize one of the primary customer needs, while stressing that the other six customer needs would not be any better or worse than existing products. Interest was measured by a 9-point scale, while preference was a rank ordering of the seven concepts. All in all, they received a response rate of ~75%!! And the winner is…all of them?? 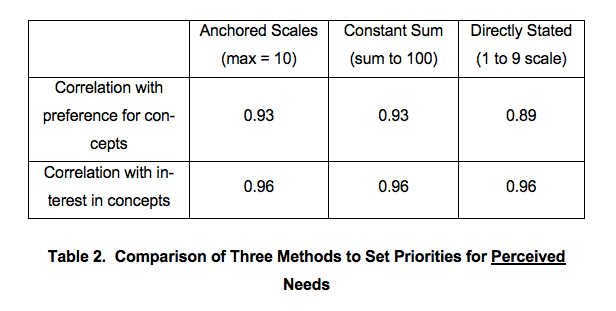 After correlating the results for each of the three methods with the self-stated measures of primary needs, here’s what they found. On both interest and preference dimensions all of the methods correlate with the customer’s perceptions, moreover there was only negligible difference amongst the methods. Therefore, any of these methods are effective tools to measure the importances of customer needs.The paper does briefly describe (but does not demonstrate) that conjoint analysis is a better method when analyzing customer decisions, but when it comes to customer perceptions there is no difference. The real learning here is that, while there may be no single “best method, employing rigorous, customer-driven analysis results in products customers want. One interesting insight was that the number of times a need was mentioned was *not* a good proxy for importance. So, high priority needs do not seem to be mentioned more often that low priority needs. As this is the final post in the series, let’s sum it all up. The Voice of the Customer model represents a rigorous process for collecting, organizing, and prioritizing customer needs that is critical for converting actual customer feedback into both product strategy and development. When collecting customer needs, 10-20 customers (per segment) should suffice to yield comprehensive list, either through one-on-one of focus group settings, and ideally using 2-3 analysts. The KJ Method is an effective method to organize your customer needs into a comprehensive hierarchy. When customers participate in this phase of the process, the product direction is often better aligned with their needs instead of reflecting the internal processes of the firm. Furthermore, the focus of this process should really lie at the secondary and primary levels, only delving to the tertiary level corresponding to the most important primary needs. While there are many different ways to set priorities on customer needs, most approaches will be quite accurate in predicting customer preference and interest in concepts, so long as you integrate customers into the prioritization process. To navigate to the initial post, which also contains a table of contents for all of the other posts in the series.